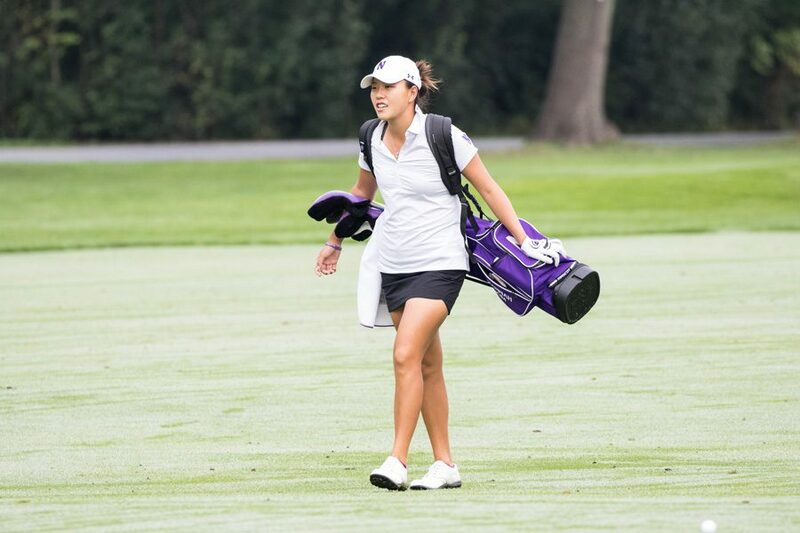 Hannah Kim walks with her golf bag. The junior tallied 19 birdies over three rounds and tied for first place in the Silverado Showdown. Northwestern may have tied for fourth as a team at the Silverado Showdown, but junior Hannah Kim took her performance to another level and split the individual title. Kim shot 8-under over three rounds, highlighted by a 6-under second round. After coming into the final round tied for third, Kim fired a clean 1-under in the final 18 holes to secure her share of the title. She carded 10 birdies in Monday’s second round, and adding five more on Tuesday was enough to tie her for the top spot with UCLA’s Lilia Vu. Kim would’ve had the outright title to herself had Vu not birdied the 18th hole on Tuesday to reach 8-under. Stanford’s Andrea Lee led the Cardinal to the overall team victory and held the 36-hole lead by one stroke, but she double-bogeyed the first hole on Tuesday and eventually finished only a stroke behind Kim and Vu. For the Wildcats, junior Sarah Cho was the only golfer who came close to Kim’s level at the tournament. She finished at 2-under and tied for 11th place overall. Cho’s consistency was her strength as she finished within one stroke of par in all three rounds. She was over par on only seven of 54 holes, a performance not even Kim could match. But the rest of NU could not match the performance of the two juniors. Kim and Cho dominated the par-5s on the course, combining to shoot 11-under on the holes. Sophomores Stephanie Lau and Janet Mao, along with senior Kacie Komoto, however, shot 3-over on the course’s longest holes. Lau was 8-over on the weekend, while Mao finished at 10-over and Komoto ended the tournament at 17-over. Each of the three posted an individual round at 7-over. Beyond Kim and Cho, sophomore Monica Matsubara was also impressive for the Cats, but she was only competing as an individual and therefore could not rescue the team score from the three 7-over rounds posted by Lau, Mao and Komoto. While Matsubara’s 5-over finish would’ve been third-best on the team, she struggled at times as well, posting three double-bogeys on par-5s across her three rounds. Still, her nine birdies would’ve been third-best on the team, behind only Cho and Kim.